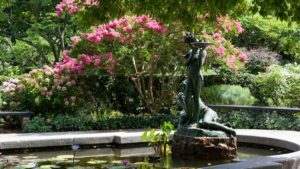 This exclusive early-evening program — custom-planned for SWINY — will include the famous Conservatory Garden. Our fifth-time guide, Michael Graff, will share insights about the Garden’s history and intentionality. We’ll learn botanical lore and facts about the assortment of plants in bloom from prominent mycologist and plant scientist Gary Lincoff (The Audubon Society Field Guide to North American Mushrooms; Knopf, 926 pages), who teaches at the New York Botanical Garden. In this year’s mix of horticulture and history, Michael will lead us to two of Central Park’s centuries-old forts. Fort Clinton, built in 1814 on a site the British had occupied during the Revolutionary War, was restored 200 years later. Then we’ll visit Nutter’s Battery, a fortification dating back to 1775. We’ll also see one of Central Park’s oldest structures. At the Blockhouse, built for the War of 1812, Michael will bring us to an historic area not open to the public. No matter how often you’ve visited Central Park, you’ll learn more than you knew before about its history, geology, flora and fauna. Both guides welcome questions throughout the tour. So start your summer with a unique, very special, and richly informative outdoor evening! Attendance is strictly limited to the first 25 people who register — sign up soon. The convenient subway-friendly meeting site will be provided after you register. No walk-in entries permitted. Attire: Good walking shoes advised. Reaching the Blockhouse involves a climb up one of Central Park’s higher hills (some stairs and a paved trail). The rest of the route is mainly on paved paths with only slight elevation. Fees: This evening program is primarily underwritten by SWINY to keep costs modest. Details for meet-up location, transportation will be sent once you register. REFUND/CANCELATION POLICY: SWINY will refund admission fees provided we are notified by noon of the first business day before the event (eg, for a Monday event, notification must be received by noon of the preceding Friday; for a Tuesday event, it is noon of the preceding Monday).